The Nicole Barr Collection features original designs with vibrant enamels and precious stones. Following the traditions of Lalique and Faberge by working with hard-fired vitreous enamel, this exclusive collection offers you something you won’t find everywhere else. 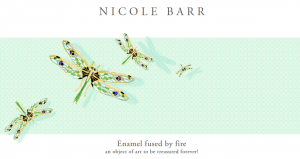 If you would like to see the full range of Nicole Barr Jewellery, please click here.